Although Andrew Di Dia was unschooled in the art of automotive design or engineering, an automobile he designed in 1953 was so far ahead of its time, it looked modern when it debuted in 1960. Unlike the thousands of modified or customized cars constructed during the late 1950s, Di Dia's car was one of a handful of true coachbuilt cars, constructed from the ground up, its aluminum panels hand-hammered by skilled coachbuilders. Most recently the Di Dia 150, as the car became known, has been honored at two Concours d'Elegance where it had a chance to rub shoulders with its contemporaries, the much desired and written about Detroit Dream Cars of the 1950s. The only thing sepearating them is the fact it was one mans' dream, constructed with his own limited funds over a period of 6 1/2 years in a small Detroit custom shop. Andrew Di Dia was born on July 15, 1917 in Detroit, Wayne County, Michigan to Gaspare (b.Oct. 23, 1888 in Marsala, Trapani, Sicily, Italy - immigrated April 16, 1904 – d. Jan 8, 1977) and Vircunza (aka Jean/Gina b. 1893 – Pensavecchia), immigrated in 1913) Didia. His parents were married in Detroit on 10 April 10, 1913. To the blessed union was born three children; Katherine (b 1915); Andrew (b. July 15, 1917-d. Feb 24, 2014); Joseph (b. Feb. 25, 1919-d. May 6, 1992) DiDia. Andrew was named after his grandfather. His paternal grandparents being Andreas (b.Oct 23,1854 –d. Apr 29,1933) and Caterina (b.1856) Di Dia. They immigrated to the United States April 16, 1904 with their son Gaspare A. (aka Alex, Jasper), and daughter Jennette Di Dia. The 1910 Detroit directory lists Andrea’s occupation as machinist, also listed was Gaspare (aka August) his occupation also machinist. The 1913 Detroit directory lists Gaspare as Gustav A. Di Dia, 56 Illinois St, occupation auto worker. Gaspare’s Draft registration card dated June 5, 1917 gives his home address as 341 Hague St, Detroit and his employer as Cadillac Motor Co., occupation, machinist. 1930 US Census list Andrew’s father’s name as Jasper (sometimes listed as Jasper, Gustave), his occupation laborer in an auto factory - home address is given as 20422 Cameron St., Detroit. The 1940 US Census lists him living with his parents at 15917 Monica St, Detroit, his occupation as ‘gap inspector’ at an ‘automobile manufacturer’. Andrew Di Dia married Josephine Ceccarelli (b. May 20, 1915, daughter of Oreste and Erminia [Martini] Ceccarelli) on September 7, 1944 in Acmetonia, Allegheny, Pennsylvania. The marriage certificate list his occupation as ‘inspector’ and his home address as 15917 Monica St., Detroit. Although his exact occupation and employer are unknown, existing references to Di Dia during the 1950s list his occupation as clothing designer. 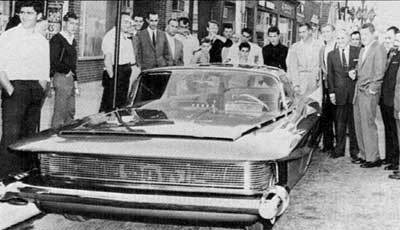 Di Dia’s interest in automobiles extended back to his childhood, and his father and grandfather had both worked in Detroit’s auto factories, his father working as a machinist for Cadillac. Andrew also found employment in the auto industry, working as a ‘gap inspector’ at one of the Detroit plants up until he got a job as a bus driver for the City of Detroit. He was a life-long car enthusiast and in the early 1950s had the Detroit custom shop of Clarkaiser modify a number of cars for him. 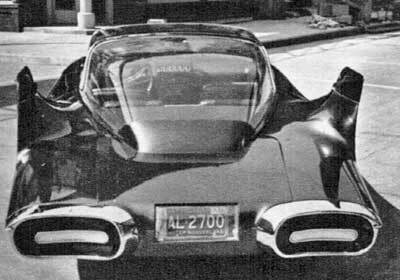 Di Dia was influenced by the creations of Alexis de Sahknoffsky and Harley Earl, so much so he that he drove around in a customized Buick with fins. 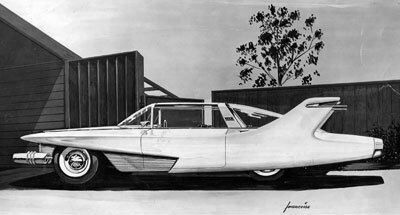 In 1953 he decided to create his own stylized automobile, enlisting the help of his neighbor*, Edward V. Francoise, to put the design on paper. Francoise just happened to be a Chrysler Corp. automobile designer, and Di Dia comissioned him to turn his ideas into a series of renderings which would end up being the car today known as "Bobby Darin’s Dream Car," a vehicle that looked modern a full decade later, and today is considered to be one of the shining stars of 50s design. A former Army Air Corps pilot, Francoise went to work for Chrysler after leaving the service. After nearly a decade at Chrysler he left to take a position as industrial designer with Guerdon Industries, a Marlette, Michigan mobile home manufacturer, where he remained until his retirement. 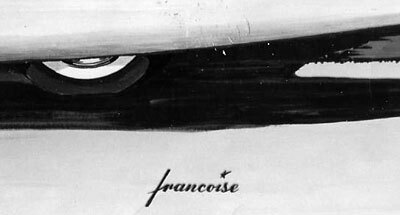 Francoise' sketches were presented to Clarkaiser Customs along with a clay scale model that Francious had provided to Di Dia. 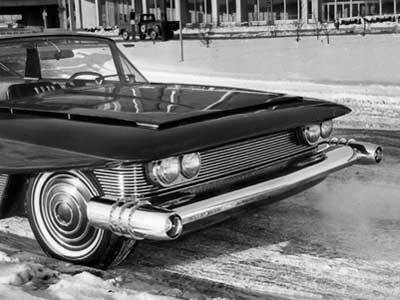 Unlike the firm’s normal custom jobs, Di Dia’s car was not based on an existing vehicle, it was created from the ground up, using a framework of round chrome-molybdenum tubing fabricated by Clarkaiser’s principals, Ronald Clark and Robert Kaiser. Clarkaiser had been formed by the two partners at the end of the Second World War, and was reportedly Detroit’s first custom car shop. During the next decade the partner’s superior fabrication skills brought them 68 first place trophies including John Cassaubon’s 1950 Ford, Larry Ernst’s 1952 Ford, Kenny Nicholson’s Arctic Sand 1948 Ford, the Gilardone Bros.’ 1953 Ford, Alan Reason’s Utopia 1950 Ford, Stan Lendzon’s 1952 Buick, Bob Palmer’s Golden Bird 1955 T-Bird, the Volpe Bros.’ 1948 Mercury and Tony Volpe’s 1951 Ford. The Di Dia project was managed by Ron Clark who is credited with the design and fabrication of its novel Ford-based swing-arm rear and independent front suspensions. Originally estimated to be a 2-year-long project, numerous setbacks and delays made it into a 6½-year-long ordeal, during which time Ron Clark took over the project on his own. 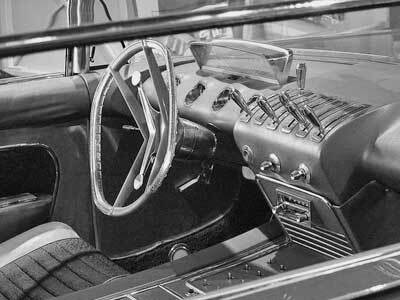 “Apart from a few pieces like spindles and wheels, the adjustable Thunderbird steering column, the Plymouth steering wheel, the Chrysler windshield, the Pontiac seats, the third member and the Cadillac engine and transmission, everything else was custom built. Both builders were excellent fabricators. They created the chassis and hand-formed the body from aluminum. They machined parts out of billet, brass and steel, then chromed, painted or polished them. “Andy was hoping for a finished car in two years, but it wasn’t until August of 1960 that the car was completed. According to Bob, the body was finally completed in late 1957. Ron’s perfectionist nature and wonderful manual skills helped produce a body that was as crisp as a pin, hand-hammered out of half-hard .064 aluminum over wooden bucks. Each fin assembly, for example, took Bob 15 weeks to shape. All the aluminum body skin was gas welded and then metal finished without any fillers. Bob recalled that before they started on the Di Dia the only aluminum-forming experience the team had was fabricated a racing hydroplane hull for a local boatyard. “Apart from the original illustration, an unscaled clay model and the specifications for an upcoming Chrysler windshield*, the team did not have much to work from. ‘We did it by eye,’ Bob recalls, building the shaping bucks and forming the metal according to Andy’s clay model. 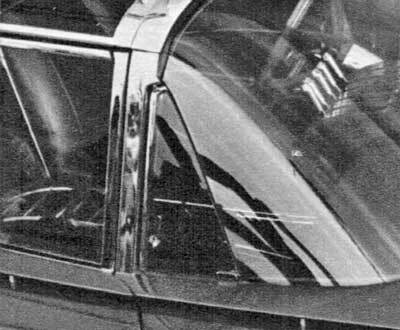 Next came the ‘secret’ Chrysler windshield – Andy had managed to get the specifications of a new Chrysler wrap-around windshield, so that part of the project could proceed. Today the windshield might be a production item, but it, too, is a work of art. 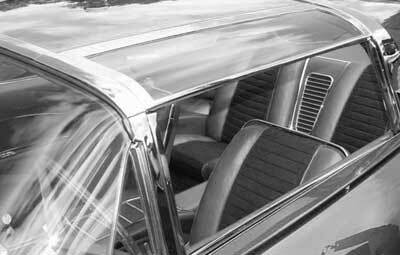 The rear window was also an integral part of the roof and rear section. Made of Plexiglas, it cost $1,500 to produce, which would equal nearly $15,000 today. “The bumpers were formed from a mixture of flat and round 8-inch steel and billet brass. They were hand-formed, rolled, filled, ground, polished and then chromed. 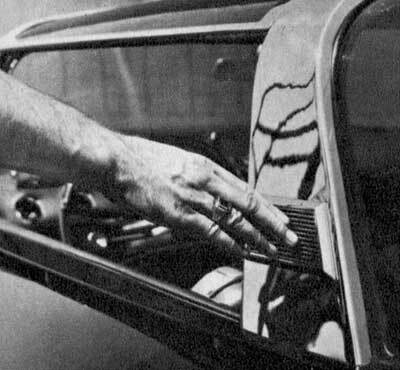 The same applied to the wild grill treatment that was fabricated out of aluminum and cut down the side of the body into the door panel. “A ’58 Cadillac 365-cubic-inch V8 was fitted into the car using a marine induction manifold that gave the Cadillac a low engine profile. A matching ’58 Cadillac automatic transmission moved power to the rear wheels. 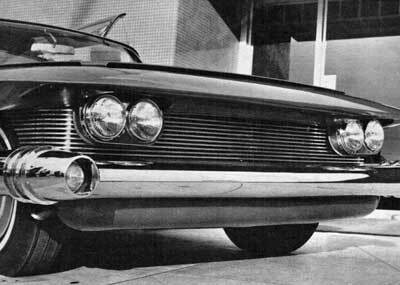 The engine was later changed to a Ford 427,mated to the Cadillac transmission when Ford wanted to the Di Dia on the show circuit. It is still fitted with this engine. “Like the exterior, virtually everything inside was custom fabricated, apart from the steering wheel and the bucket seats. A pair of Pontiac bucket seats were trimmed in bronze leather and fabric to match the interior. The dash panels feature a freestanding, see-through speedometer and four recessed gauges. There is also a unique six-lever control panel on top of the dash for transmission, wipers, lights and so on. “Custom cars and boats, original-design sports cars, hotrods, new cars, racing cycles – more than a hundred exhibits will attract car and boat enthusiasts to the Kern County fairgrounds Nov. 24-27, for the third annual Bakersfield Motor and Boat Show. “Two buildings will be required to house this year's vast collection of automotive arts, says show producer George Barris, who is also one of the country's top custom car authorities and editor of several national auto magazines. “The show will feature champion racing cars, movie and television cars, several entries by local car clubs, and many new cars and boats. In addition to the cars and boats, there will be a queen contest on the stage of the auditorium the first evening of the show, and regular free entertainment throughout the show's four-day run. 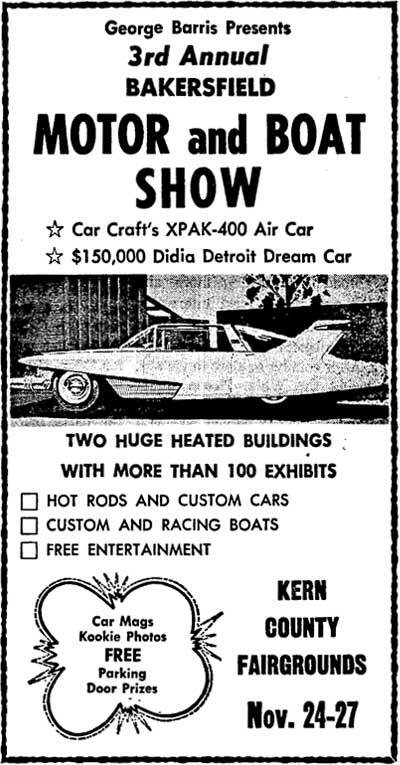 “One of the top attractions at this year's show will be the XPAK 400, revolutionary air-propelled car designed by George Barris of Car Craft Magazine. This car, which rides on a cushion of air five inches above the floor, will be demonstrated during the show. “The $150,000 Di Dia will also be displayed. This will be the first public showing of the all-aluminum, 510-horsepower ‘dream car’ designed by Andrew Di Dia, which took six and a half years to build. Although he wouldn’t find out the truth until 1968, Darin had been raised by his grandparents. for three decades Darin thought they were 'his parents' – and that his real mother, Vanina (Nina), was his ‘older sister’. Nina’s husband, Charles Maffia, Bobby's ‘uncle’ was actually his stepfather. Darin, who was born in the Bronx as Walden Robert Cassotto on May 14, 1936, was stricken with recurring bouts of rheumatic fever at the age of eight that left him with a seriously weakened heart. He discovered his condition at the age of 16 and soonafter began working as a songwriter in his native Manhattan. camethereafter becamerealizing he was unlikely to live a long life he pursued his career at an often fanatical pace. As his star rose in the musci business Darin turned his sights on becoming a movie star, appearedin in a number of television productions, and in 1960 co-starred with his future wife, Sandra Dee, in 'Come September,' for which he received a Golden Globe. Darin like Di Dia's car and the two came to an arrangement where Bobby would use the car at awards shows, openings and photo opportunities. “Hollywood, Mar. 31, (UPI) – There’s this car and it cost $150,000. That’s what the press agent said. “He’s Bobby Darin’s press agent. Darin is a singer. He doesn’t claim to be modest. He says he wants to be the biggest thing in show business by the time he’s 25. He’s got six weeks to make it. “But $150,000 for a car? “There it was. Maroon. All hand-made. Aluminum from top to bottom. Tail fins higher that the roof. “‘It’s easy to park if you own a city block,’ said Darrin. “Actually it only cost $93,647 and 29 cents,’ said Andrew Didia, a Detroit men’s clothing designer. He and Darrin designed the car. “It’s eight-cylinder. The headlights wing down. The doors open electrically by the push of a button on the top – and the sky view glass sections on the sides raise up at the same time. “Most of the top is glass. The seats are plush brown and black. The doors are a foot thick. The mufflers are under the front bumpers. “Didia said the car is finished with 30 coats of imported pure pearl oil of essence with added crushed diamond dust to make things sparkle. “Hollywood, (AP) – They won’t outshine Bobby Darrin at the Academy Awards show April 17. At least not up to the curb, they won’t. “The young singer and his actress wife, Sandra Dee, will wheel up to the bright lights at curbside in a handbuilt dream car, which cost almost $100,000 to build. “It’s a 500-horsepower. Four-foot high sedan with a mostly plastic top, disappearing headlights, and a 30-coat lacquer paint job made of crushed fish scales and diamond dust. “One of the most fabulous dream customs ever to come true was created by Andy DiDia of Detroit. Immaculately finished in every detail, the handformed aluminum body and tublular frame, 6 ½ years in construction, are valued at $150,000. “Fabulous custom DiDia was handformed from .064 half-hard aluminum. Frame is made up of three-inch alloy tubing. From ground to top, car hugs the road at a low 48 inches. When doors are open, a torsion bar lifts and opens skyview top sections for greater headroom – make getting in and out easy. 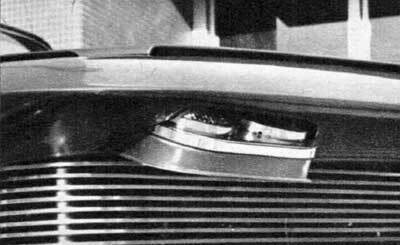 Windshield wipers are hidden under cowl flap, which opens automatically. “White, frosted backup lights are set in the center of combination tail light and bumper rings. Custom-made rear glass is formed of Plexiglass (in one piece) and cost over $1500. High, sleek tail fins house tail lights and directional signals. 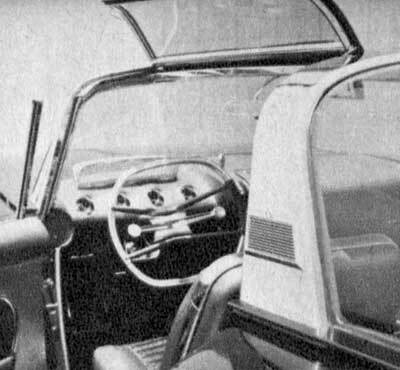 “Windshield is double-wrap design, with windwings cut into ends of the glass. Headlights are normally concealed in upper part of grill. Photo shows headlight starting to swing down into position when switch is turned on. Bumpers are made of 10-guage spring steel, and house directional lights in front of the tip tubes and read clearance lights facing rearward. Exhaust pipes are beneath this. “Headlights tilt up out of sight; roof flaps rise as doors open; a touch opens doors electrically; controls are levers or buttons; trunk lid opens sideways; directionals are automatic. “Pittsburgh – (AP) – The automobile status symbol to end all status symbols has made its entrance on the American scene – but anybody who want to be the first in his own block to own one had better think twice. “At $1,000 down and $100 a month, you could pay this one off in about 124 years. “It’s the ‘DiDia 150’ or ‘Bobby Darin’s Dream Car,’ depending which name you prefer. Owner and builder Andy DiDia, a Detroit clothing designer, doesn’t care; it’s his car, but singer Darin is a friend of his. “The Darin-DiDia rolling palace showed up as the star of the third annual Rod and Custom Show put on by the Washington (PA.) Timing Association. 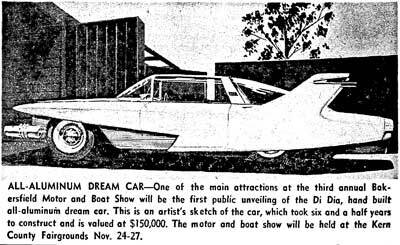 “With some 125 cars, the quick and the costly, marshalled in Pittsburgh’s City Auditorium, there was plenty of competition, but the DiDia 150 grabbed attention from the outset with it spinnaker-sized tailfins and its dazzling price - $150,000. “Owner DiDia explains that labor alone, seven years of it, accounted for $93,647.29. A very precise man, and it shows in the car he designed. “Surprisingly, it is not really flashy. Clothing designer DiDia tailored the body to relatively simple lines in a solid, russet-color finish that is fairly subdued for a mixture of paint and diamond dust. 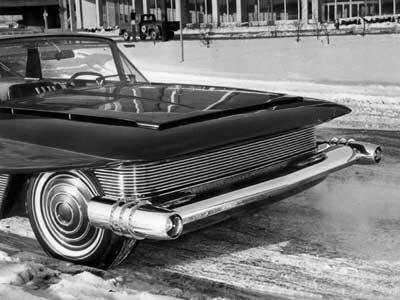 Apparently Di Dia forgot to turn the electrically operated cooling fans (controlled by one of the switches located in the center console) before Darin took off with the car and the big Cadillac engine quickly overheated. Perhaps it was a bad omen, as Darin, who was competing with John Huston, Hugh Griffith, Melvin Douglas and Nick Adams for Best Supporting Actor, lost the Oscar to Melvyn Douglas for his appearance in Hud. 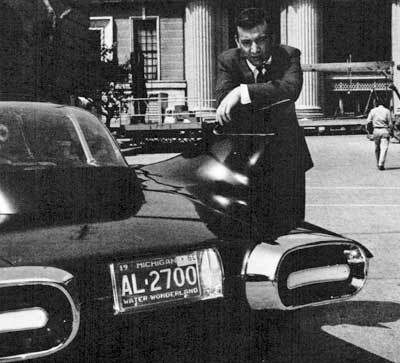 The 1964 Academy Awards was the last time the car was mentioned in the press. During the ensuing years the Cadillac 365-cu. V-8 was swapped out in favor of a Ford 427 and the car's antiquated torque tube and traverse spring setup replaced by a more comfortable two-leaf rear suspension and standard axle. Sometime prior to that time ownership of the car transferred from Di Dia to Darin because in 1970 the latter donated it to the Museum of Transportation in St. Louis, Missouri. During his decade plus working on the road with Darin, Di Dia continued to design apparel, the details being ably handled back in Detroit by his wife, Josephine. Di Dia remained active in the garment business into the 1990s, his last known address being 27500 West Nine Mile Rd., Farmington Hills, Michigan., an address shared byhis garment company, Esquire Sportswear. In 1981 The Museum of Transportation in St. Louis, Missouri took the car to Manns Auto Body Shop in Festus, Missouri to have it restored. The work was done by Mike Manns and Arty Roberts, and remains one of the most influential projects to ever roll through the shop, which continues to maintain it today. 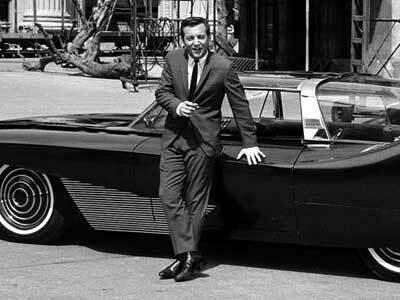 “The late singer Bobby Darin's "Dream Car" is back on display in dazzling shape. “Mike Manns, owner of Manns Auto Body in Festus MO, restored the car for the second time since Darin donated it to the National Museum of Transport here in St. Louis in 1970. “The car, designed by Andy DiDia in 1953 was ‘one of the most fabulous custom cars ever built with every futuristic innovation money could buy,’ Manns said. “It cost Darin more than $93,000 and took seven years to build. Darin drove the car to special events, including the Academy Awards presentation. 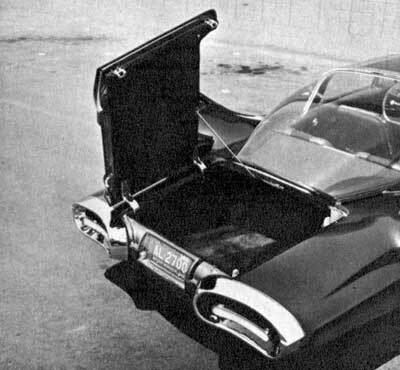 “The car, which looks like a square version of the Batmobile, was the creation of a clothing designer, not a car manufacturer. The story goes that Darin struck up a friendship with DiDia, a well known clothing designer from Detroit. 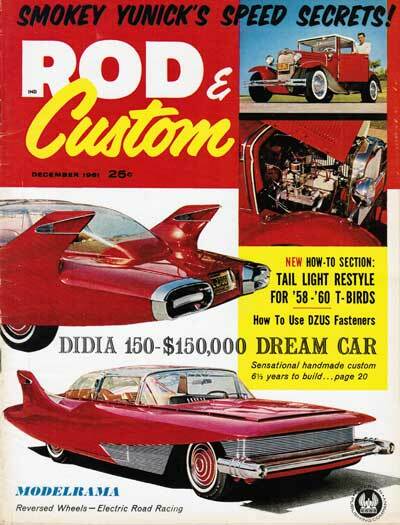 DiDia, an auto buff, designed the car on a whim and showed it to Darin. Darin loved the lines and made a few suggestions. “They dubbed the ‘DiDia 150’ the ‘Bobby Darin Dream Car.’ Originally, the car had 30 coats of paint, mixed with a diamond dust from Sweden. “This time, Manns used a glittery gold undercoat with pearly red on top. Since that time it has made a number of appearances, and 40 years after it was first shown in Detroit it won the Preservation Award at the51st Detroit Autorama, accompanied by its designer. Di Dia also accompanied the car when it was exhibited at the July 25, 2010 Meadow Brook Concours d'Elegance at Rochester, Michigan, as part of a featured display of museum owned cars. More recently the pair were the main attraction of the 2011 Keels & Wheels Concours d'Elegance in Seabrook, Texas. The Di Dia 150 remains on display at the Museum of Transportation in St Louis, Missouri. 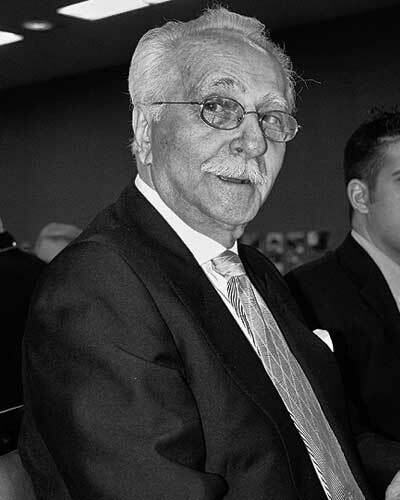 Andrew DiDia, its designer, passed away on February 24, 2014 in Redford, Michigan at the age of 94. He was predeceased by his wife Josephine, who passed away on Jun 4, 1985. According to his son Terry, the car's delineator, Edward V. Francoise, was never paid for his efforts. 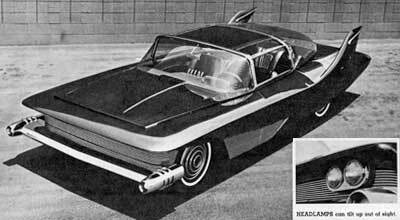 "In the 1950's, Andy DiDia commissioned Edward V. Francoise to conceptualize and draw the car today known as "Bobby Darin’s Dream Car by Andy DiDia. "My father at that time was an auto stylist designer employed with Chrysler in Detroit. He worked at Chrysler after serving in the Army Air Corp as a pilot for 10 years until 1958 when he became an industrial designer and stylist in the mobile home business moving to Marlette, Michigan and continuing on for the next 20 plus years in that endeavor. 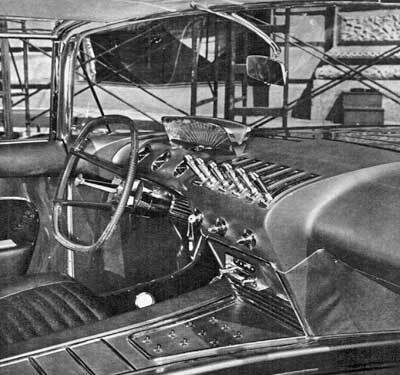 "I am not sure where they met, but I would be sure that the windshield from Chrysler was incorporated by my father’s efforts, and possibly the Plymouth steering wheel. Andy DiDia lived just down the street from us. The finished windowless picture in the coachman article was taken in his driveway. He lived at 19130 Riverview, Detroit, 19 MI and we live down the street at 19295 Riverview, Detroit, 19, MI. I also retain a letter from friend and Attorney at Law, Alfred Plotkin, advising my father to take legal action to collect his design commission, which he never did. Mr. Plotkin also lived on Riverview in Detroit. "A couple of years ago, Mann's restoration in Missouri, whom refurbished the Dream Car a few years ago was very interested in my data, and we exchanged materials. They are involved with the Museum of Transportation where the car presently resides outside St. Louis. "I personally saw the car several times while it was at the Didia residence garaged. "While there was no known engineering of the vehicle by Ed Francoise, the concept design is pretty important. And for that, Edward V. Francoise should be recognized. The picture I am attaching was used many times in publications, and my father’s name was always removed. All information provided here can be corroborated. This One Cost $93,000 - Mechanix Illustrated, ???? Al DiOrio – Borrowed Time: The 37 Years of Bobby Darin, pub. 1981. Al DiOrio - Bobby Darin: The Incredible Story of an Amazing Life, pub. 2004. Dodd Darin & Maxine Paetro - Dream Lovers: The Magnificent Shattered Lives of Bobby Darin and Sandra Dee, pub. 1994.